Discussion in 'iPhone and iPad Games' started by riquardo2, May 19, 2015. 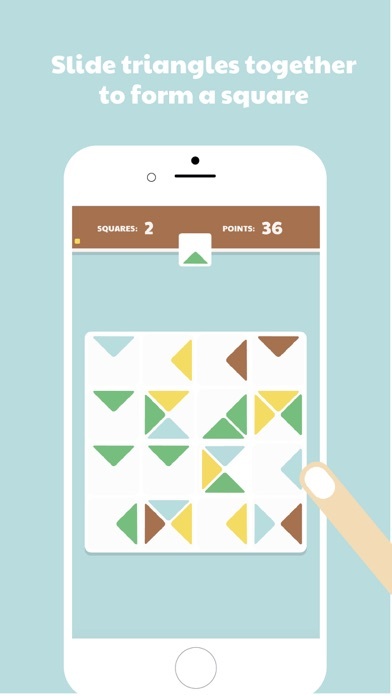 I'm launching my puzzle game today, Triangulae, where you have to slide triangles together to form squares. There are three game modes available and nothing is as easy as it seems! 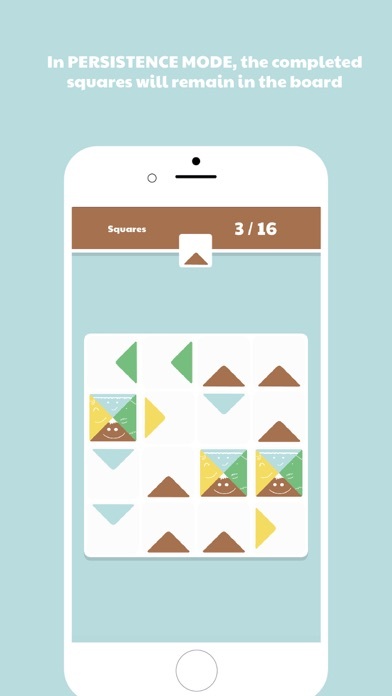 "Triangulae is a puzzle game that’s deceptively tricky." ~ mashable.com "Simple mobile games can sometimes be the most addictive. Such is the case for Triangulae, which has a simple style and concept, but challenging gameplay. " 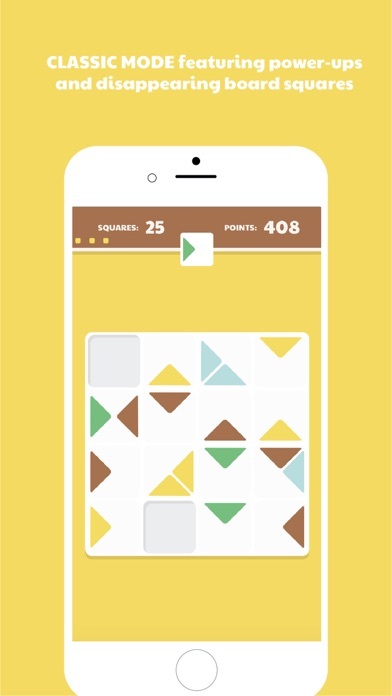 ~ indiegamemag.com "Triangulae is fun and challenging, and the musical background fits the mood of the game perfectly" ~ appadvice.com Triangulae is geometric a puzzle game about fitting in, where you have to slide triangles together to form squares. 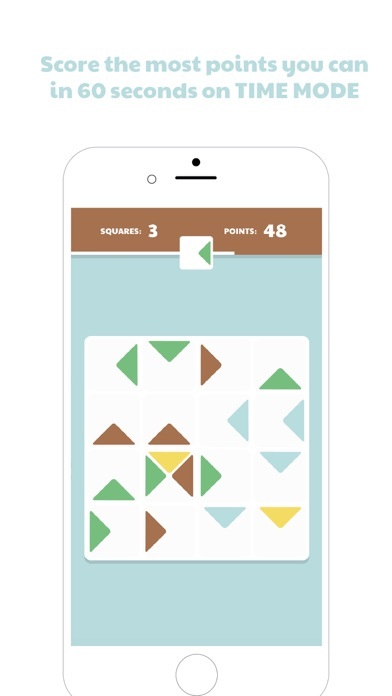 There are three game modes available: *CLASSIC: make squares while getting power-ups and disappearing board squares; *TIME: score the most points in just 60 seconds; *PERSISTENCE: when you make a square with triangles, they remain on the board. Enjoy! So I tried Classic mode so far and I really like the game. There's enough depth to keep me interested for a longer period of time. I scored over 1000 points on my 3rd attempt, made it to level 5. A few nitpicks first (I wouldn't call it criticism, just a minor annoyance). I'm really missing GameCenter implementation. This game begs for it. There are high scores to compare and chase, but it stays local at the moment. I noticed "achievements" during gameplay like 2 on 2 or perfect square etc. It'd be great to have them on GameCenter as well. I've seen two typos, didn't make the screenshot though. Also, graphics-wise I'd use just one font for the whole game. It really bothers me there's more at the moment. I like the bold one. Combination of all uppercase, lowercase and first letter capital seems like overkill as well. I'd use just one to keep it clean and minimalistic. After finishing the game the only option is to tap "try again? ", I'd suggest a menu button to go back to main screen. Ok, time to mention some pros now. I really love the colors. Music fits it well, it's quite enjoyable and complements the mood perfectly. Everything feels very smooth and responsive. Swipe controls works flawless. I like "the next piece" hint's position (and a fact it's even exists). As I wrote earlier, gameplay-wise there's enough depth to keep it interesting and chasing higher scores is just a plus. In classic mode it's very relaxing. I didn't try the time mode cause I really don't like being rushed into anything, so it's not my favorite mode (in any game in general). Overall, I'm very satisfied with this game. It's a great choice to any puzzle genre fan and I can only recommend it. You won't be disappointed. Wow thank you for the thourough review macplash, really appreciate that and will definitinely take that into consideration while thinking about the next version of the game. On another note, I would love to have the main page review Triangulae, any thoughts on how that could happen? I already sent an email to tips@toucharcade.com not sure if there's anything else I could do. Nitpicks: Persistence mode is unfair. As soon as it provides you with the 16th of any orientation of a triangle the run is over, no matter what you do, since any further move will overlap two of the 16 triangles (including the completed squares). You should code it so that it never gives you more than 15 of any type triangle until there are only two open squares left. This will make it feel more fair. Classic mode is fun, but it lacks one thing that could make it super addictive; the feeling of endlessness. Every ten squares a square gets blocked out. The player is aware that this will end, and soon. In a game like Threes, there is of course a mathematical maximum you can reach, but it's so far away that it doesn't matter. The player has the illusion of endlessness. They can keep going, get a higher score! Here, not so. Game rounds will soon become claustrophobic very quickly, making getting a highscore a matter of combos and special squares, which, while interesting, lacks the simple appeal of a casual game which is what this is. Pros: Nice graphics fitting with the current trend in minimalist, flat, pastel designs. Novel mechanic which is quite fun to grasp at the beginning, and with the addition of some different modes, could be expanded on in really cool ways. Persistence mode is lovely, apart from the slightly unfair run-ending random generation. The 'next piece' image is well implemented in the game and is crucial to planning out your moves. Adds a layer of strategy and thought. Controls are great, layout etc. are all perfect for a game like this. Wow another thorough review, thank you so much TheGreatEscaper! The tip you give about Persistence mode is interesting, I will look into it and experiment further. As to the Classic mode vs endless, I get what you say. In one early version, the classic mode didn't have the disappearing squares when you change level (thus endless sort of), but it felt to me that it was too easy sometimes, and it could bore players. If they could have a choice though, to play Classic Mode OR an Endless mode added to the game, now that would be a totally different thing and I might add that into one of the next versions. Every ten squares a square gets blocked out. The player is aware that this will end, and soon. In a game like Threes, there is of course a mathematical maximum you can reach, but it's so far away that it doesn't matter. The player has the illusion of endlessness. They can keep going, get a higher score! In later levels I managed to get rid of blocked squares somehow, but I'm not sure how. I didn't find any description or a guide how to do so. I'm just saying it's possible to unblock the square so there's some feeling of endlessness after all. macplash you're right, when you get a power-up square there's a chance (small though) you can recover a square that was taken out when changing levels. Thank you all again for the support first of all. Here and elsewhere people have been saying good things about the soundtrack too so I decided to put it up out there for everyone to download. My turn to leave some feedback. I love this creative and unique puzzler game. You work with a grid of virtual squares. Each square has a different colored triangle in a different area, in it. (Imagine squares being cut into 4 sections with an X to make those triangles) your job, should you take it, (he he) is to slide, with a simple finger swipe, a triangle into an empty spot in a square nearby. You get more points if you can manage to make all the triangles/square the same color. Every time you move a piece, a new one appears, randomly, in the square the piece just occupied. The goal is to complete a square and keep completing them until you can complete no more. Then... Game over. there will be times where a square will get blocked off, making the game more difficult by giving you less choices to move your piece too. Yikes! At the top of the grid, you can see what the direction and color of the next triangle is going to be. This can help you plan what your next move should be. Triangulae is a game of planning and strategy. The more you play the better you'll get. Which is not a big deal, because this is one game that will keep you coming back. 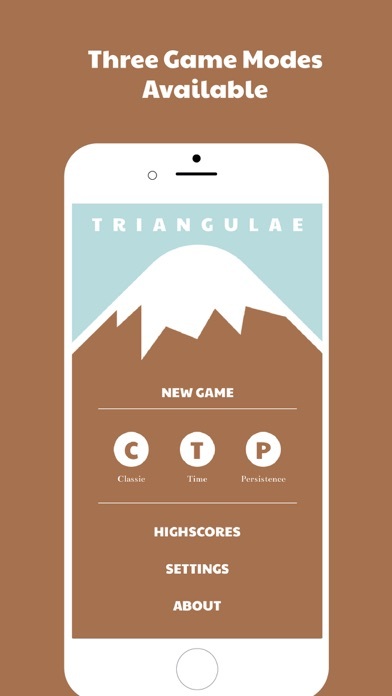 Triangulae has a new version out, with a new game mode, game center integration, and more. To celebrate it, here are 5 promo codes! PS (and EDIT): also made a web version of the game so everyone can try it for free (and you can also embed it on your website)!